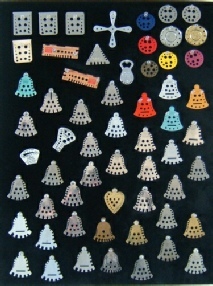 We have a collection of over 200 knitting needle gauges, which were collected over a period of about 15 years. We no longer actively collect them. Many are flat and displayed on black velour boards; others are an integral part of a wool holder or needle box so sit on shelves. The oldest date back to 1847. It is possible to roughly estimate the age of a gauge by looking at the size of needles that it was intended to measure. The oldest gauges are from the days when wool and needles were very fine. 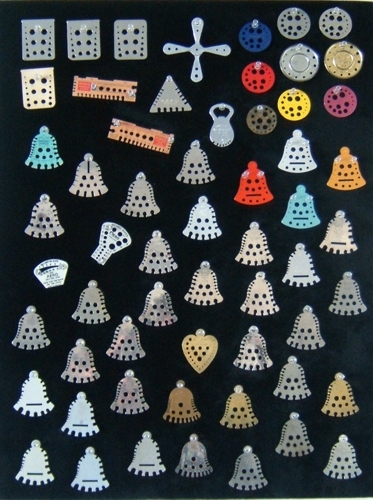 Gauges from 1847 have slots for size 28 needles. 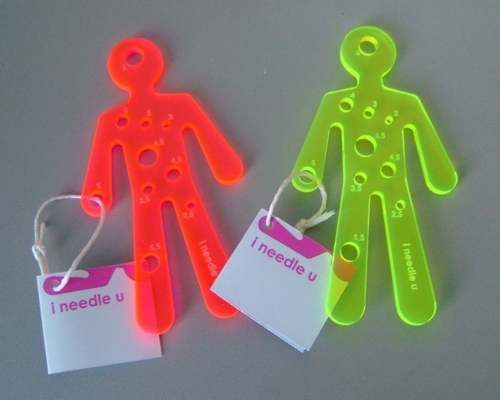 In those days needles were usually referred to as knitting pins or wires. 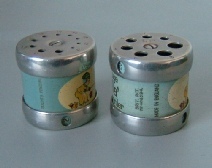 The sizes were based on the measurement of industrial wires. It may seem contrary that the finest needles had the highest numbers but this is because it relates to how long a piece of wire was stretched out to be. A size 2 needle means that the wire was stretched twice as far as for a size 1 needle. A size 28 means the wire was stretched 28 times as far. 28 needles could be made from the same piece of wire, making a very fine needle. Naturally, most of our gauges are British though several are from other parts of the world. 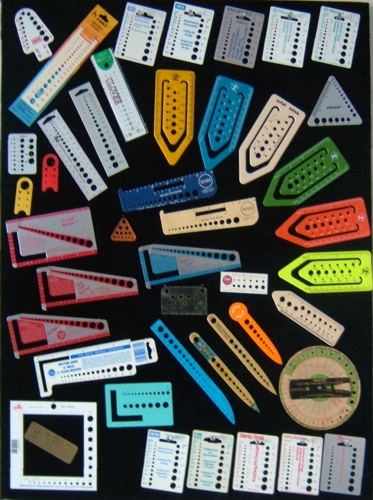 Similar gauges are grouped together on the boards, though the grouping is not always entirely logical. Many people would consider bell gauges to be common but these are all different. 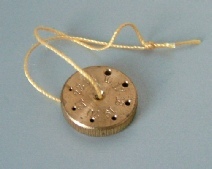 Some are indeed fairly common but there are also bells bearing the names and logos of small yarn companies. 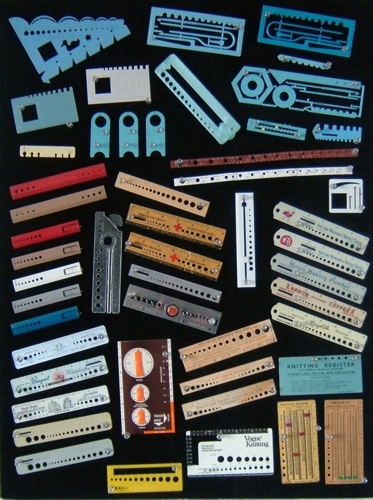 Others changed over time so differ in the metal, placement of holes and slits, text, etc. One simply has a spelling mistake with ‘gauge’ written as ‘guage’. Most of the blue plastic gauges, on the centre board, were free with various magazines. I have no idea why they were so often blue. 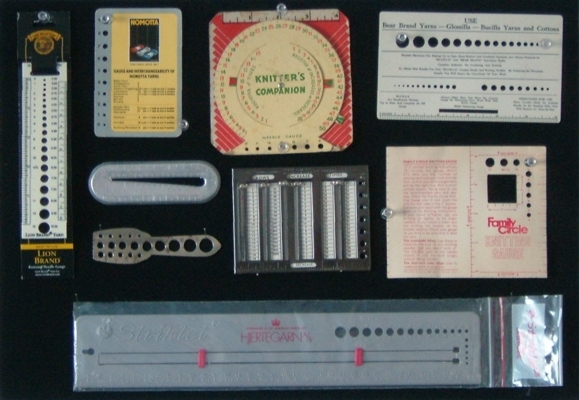 Many of the other gauges on that board were given away as advertising for products such as soap powder, coffee and flour. When comparing gauges it becomes obvious that they are not as standard as one might hope. On the centre board above are two versions of the MP Knitting Needle Gauge Glove and Sock Measure (One is white, the other brown.) Even in the photograph it can be seen that the overall length of the measures is not the same; they do not have the same size inches! Several of the gauges on the third board also have another purpose. 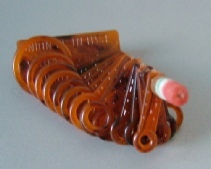 There are letter-openers and paper clips, in addition to calculating and measuring devices. 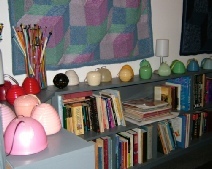 The beehive was the trademark of Baldwins (later Patons and Baldwins). 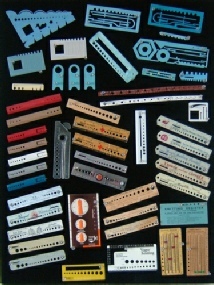 The earliest were in metal; later versions were in various ‘plastics’.) 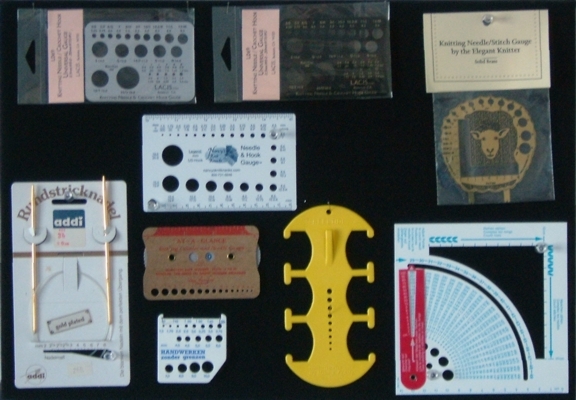 We have several from Australia where the gauges were made of a different plastic from British versions. 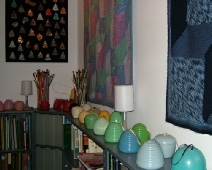 We have several woolholders, with gauges in the bottom. 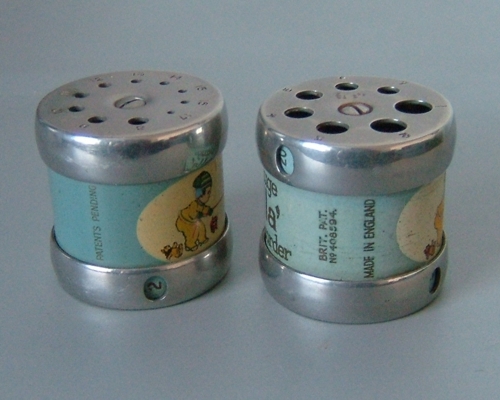 The beehive-shaped holders were made by NB Ware. I don’t know how many colours were made. We have ten. The boxes below all have holes or slits in their lids for measuring the needles. Most of those in the photo on the right are made from Bakelite. 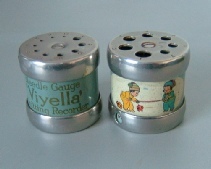 Viyella gauges are different from any others. They can be difficult to find ... and expensive. There are holes on both ends and the ends of the drum also rotate to show numbers for counting rows. The smallest hole is size 17. There are at least four different gauges. 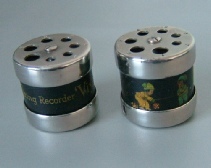 Two have black bands around the centre; one with writing, the other with a picture. The paler versions may look the same at first glance. 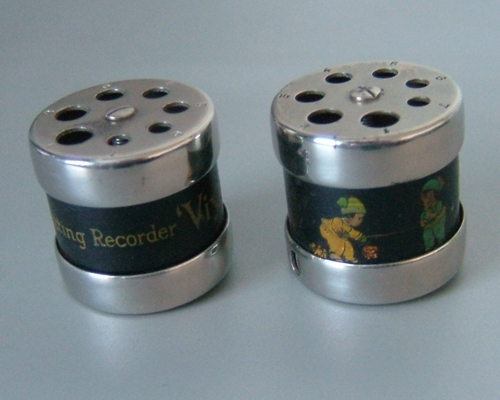 On the back it can seen that one is described as Patents Pending whilst the other has a patent number. The patent was granted in 1932. March 2019 - Blog posts with more pictures and information. Many of the gauges have now been reorganised. 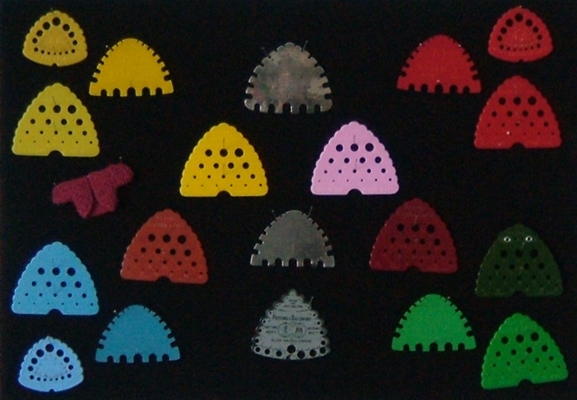 These represent more modern versions of the same tool. The circle in the centre is unusual for a modern gauge as the sizes go down to 24. It is intended for people who do miniature knitting. Strangely the sizes range from 16 to 24 but there is no 23.